Earthquake At Richter Scale Of 5.8 Hits Delhi NCR, Chandigarh, Uttarakhand. Epicentre In Pipalkoti. High density Earthquake tremors were felt in Delhi-NCR and Uttarakhand at around 10:30 pm. It lasted for 30 seconds. The quake was very high in comparison to what we have seen in the last years. India’s capital city Delhi and the surrounding areas was rocked by a quake today on Monday night. The epicentre of the earthquake is yet to be declared but believed to be somewhere in Uttrakhand. According to reports, strong tremors were felt in Gurgaon, Noida and adjoining areas of Delhi for nearly two seconds. Latest: We were able to get the image of epicentre and affected areas. We would be waiting for a news from Dehradun for the conditions of city. According to the latest update from national media, the quake was observed for a period of more than 5 minutes across the country. The tremors also felt in part of Rajasthan and Jaipur too. 22:53 Latest news about Delhi: Earthquake At Richter Scale Of 5.8 Hits Delhi NCR, Chandigarh, Uttarakhand. Epicentre In Pipalkoti. 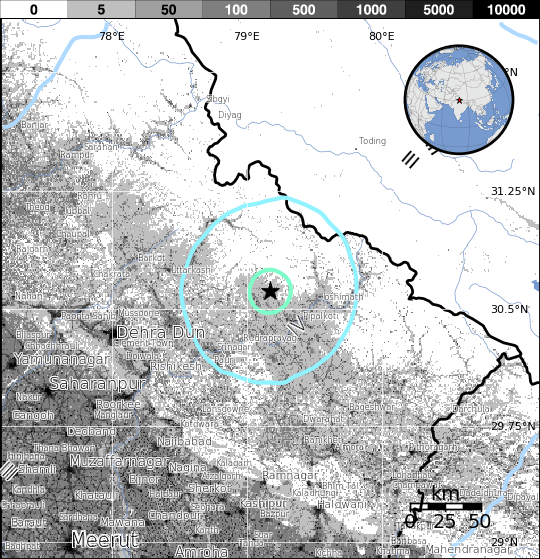 Correction: According to the latest news about earthquake from USGS, the epicentre of earthquake in Delhi was 35 km from Pipalkoti, not Rudraprayag or Pithoragarh. Being more specific, Alaknanda river bank was the most affected area. Today, there were news of Prime Minister Modi scheduled rally in Pithoragarh city of Uttrakhand. If any major loss happened because of natural disaster, it shall be a serious concern for the authorities.